In Business Magazine is a collaboration of many business organizations and entities throughout the metropolitan Phoenix area and Arizona. Our mission is to inform and energize business in this community by communicating content that will build business and enrich the economic picture for all of us vested in commerce. In Business Magazine is proud to connect the legal community with businesses throughout the Valley with this annual Legal Guide. The law firms included in this guide are firms that are familiar to In Business Magazine, have reputable practice areas specific to business and support the business community in several ways. We have included profiles of our supporting firms, providing even more information of their services and top attorneys. Please visit inbusinessphx.com/legalguide to get a more detailed list of attorneys with these firms and to search by practice areas. In Business Magazine’s Healthcare Decisions: Open Enrollment & Healthcare Guide for Business is a special section meant to remind company owners as to the options that are available in the upcoming individual marketplace open enrollment window. Open enrollment timing can happen throughout the year for company policies, but with the national window open during this time, we feel it is important to highlight various opportunities and list those groups offering plans and/or services. Using healthcare as a tool to build productivity through a healthy workforce is an advantage to business regardless of regulation and/or mandates, and it is becoming ever clearer that healthcare will be a focus for business owners and not simply an outsourced option as it has been in the past. In Business Magazine is proud to present the annual “Excellence in Banking” special section showcasing top bankers and bank executives in the Valley. These top professionals work day in and day out with business owners to assist in ways that can only be classified as a true asset to business. We sought out professionals at each of the community and national banks with a strong local presence and hand-picked the following as examples of the incredible work that our banking community does, and in a financial climate that is mired in regulation and change. We are pleased to offer the list of Alliance of Arizona Nonprofits members who are participating in Arizona Gives Day. 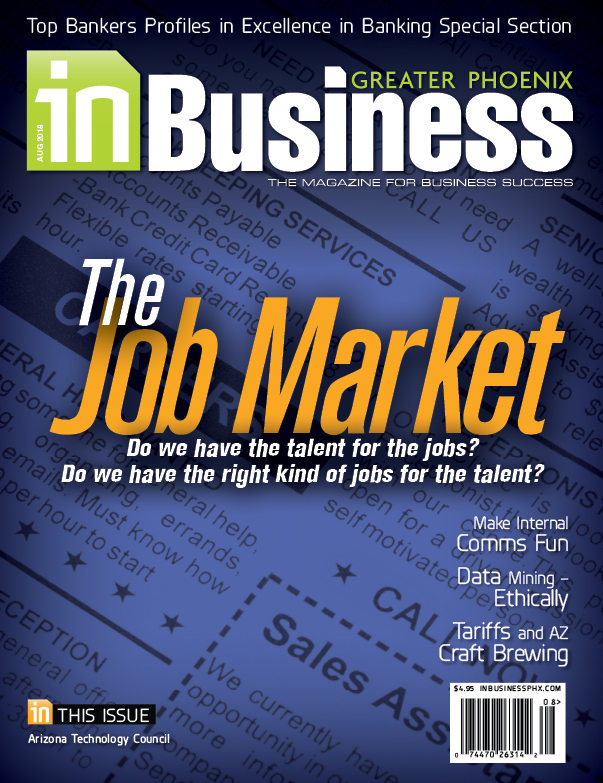 In Business Magazine is proud to create this Giving Guide to provide business owners and the more than 36,000 subscribers of the magazine information on local nonprofits that they may work with to better our community. Our goal is to give these groups exposure for a full month prior to Arizona Gives Day so that they may realize additional benefit among the business community. 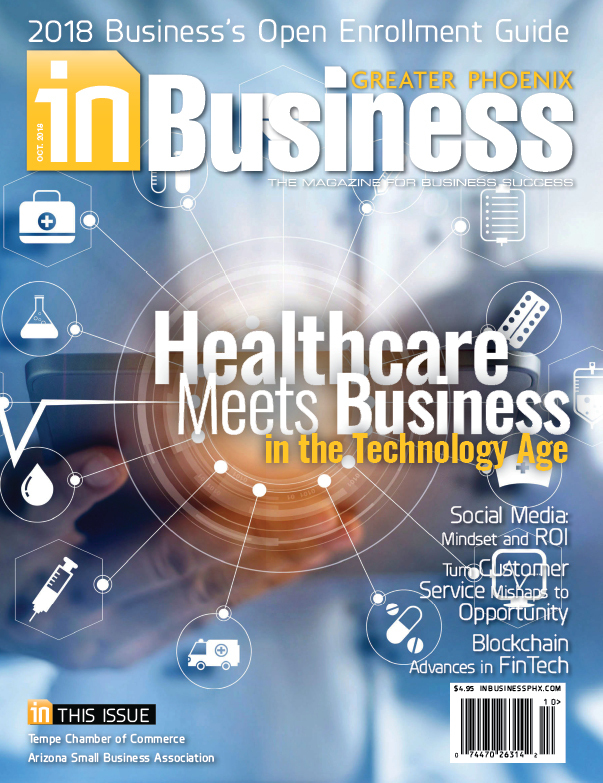 With healthcare front and foremost on the mind of many business owners and executives, and recognizing that healthcare and wellness programs involve the whole community working together, the editorial staff of In Business Magazine has compiled the Business Healthcare Services Guide. Presented are listings of companies in the healthcare industry, organized by category. As part of our service to our readers, our editorial staff has invited these top commercial real estate companies to provide information on themselves, their expertise and details relating to their business in this Commercial Real Estate: Spotlight on the Best special section. The real estate market is improving and these companies are proven leaders in the Valley. The Top 50 Small Business Industry Leaders special section is a resource guide of top small businesses or small-business service companies vetted by In Business Magazine editorial staff and recommended to you, the reader. Serving your business with quality companies can make all the difference in running a small business. These leaders are dedicated to serving their clients, provide proven service and have a high degree of experience in their given fields. We recommend that you do business with them. The Women of Achievement section profiles woman who have proven her involvement in our business community and her connection to doing good for our community, and has demonstrated great success in business. Their varied strengths are part of the mesh that binds and supports the greater community and attests to the collective achievement of women in business. In an increasingly volatile business climate – buffeted not least by the stresses from continuous and increasingly rapid technological changes and unpredictable political forces – it’s the leadership that counts in keeping a company strong and moving forward. In Business Magazine reached out to some of the Valley’s core businesses and asked the men and women at the helm to share the experience they’ve gained over this past year. Especially, we asked them to look externally and consider what significant changes in the economy or their industry their company needed to address this past year and how they addressed those challenges, and look internally to review the best thing they’ve done over this past year in regard to management of their employees. This special section comprehensive compilation of the Valley’s top sites for business events, conventions and meetings. Our Valley is home to some of the best properties, with state-of-the-art technology and facilities to ensure the success of your next great event. In Business Magazine has compiled this guide so companies can compare amenities and make choices for their local events. This guide will be online at www.inbusinessphx.com for a full year. Funding is consistently among the top concerns shared by our readers. As part of our “Banking” issue of In Business Magazine, our editorial staff has compiled this annual Business Lending Guide. This guide is a listing of local lenders, contacts and resources that will assist business owners in finding lending opportunities. We contacted federally and state-chartered banks, credit unions and selected other lenders and resources to provide information about the variety of loans or assistance programs they offer locally. Our list is compiled of institutions based here locally who responded to our questionnaire by press time. Please check the information, as contacts and phone numbers may change throughout the year. Many of the institutions have multiple locations throughout Arizona; this guide lists their main office in the Greater Phoenix area.